When Cookies Lead to a Cookie All Star…and a Cat?! Oh no! Not another cat reference on the Girl Guides’ blog! Yes, but this time this cat isn’t out of the bag, it’s purring in a Brownie’s lap. How it got there is what today’s post is all about. It started out with a cookie box, a cookie selling rewards initiative program and one very, very resourceful girl! Cookie All Star, Girl Guides of Canada’s exciting cookie selling rewards system, is entering its fourth year this cookie season. Girls earn fabulous rewards and get recognized for their efforts while achieving their own individual selling goals, and collectively raising funds for their Unit. Two years ago, Brownie Claire set a personal goal of selling 40 cases to earn one of the Cookie All Star rewards – the $125 Future Shop Gift card. With a lot of leg work going door to door, she managed to earn it! But that wasn’t where this story ends. Little did her mother know that Claire’s plan (all along) was to resell the gift card, “dollar for dollar”, to her dad, and use the money to purchase a cat at Pet Smart! Claire is now the proud and very conscientious owner of Charlotte, a very affectionate kitty. Cheryl Talbot, Claire’s mom shared this story with us to highlight her daughter’s innovation and perseverance and also to show that with a little resourcefulness, even an incentive that isn’t something a girl may be particularly interested in, she can use it to lead her to something she really wants. I love my netbook and am so proud of myself for achieving my goal. I gained self-confidence through selling door to door cookies. Thanks so much for the computer! It’s fun, and this year I am aiming for 80+ boxes! Did you know? 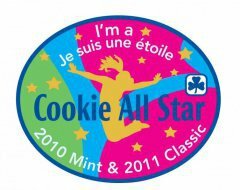 The 2010/2011 Cookie All Stars sold almost 156,000 cases of cookies and 88 girls reached the top award level of 80+ cases. These top sellers alone were responsible for selling over 7,000 cases of cookies! The fall chocolatey mint campaign is starting! And this season we have a cookie box craft contest too! Are you participating with your Unit? This entry was posted in Cookie Bits N Bites and tagged brownies, cookies. Bookmark the permalink. 1 Response to When Cookies Lead to a Cookie All Star…and a Cat?! My daughter was very proud to be the first girl in our city to earn the top award of a laptop and she did it as an 8 year old Brownie in her first year being a part of the Girl Guide organization. It’s amazing where ambition can take kids! This year she already has her sights set on the second highest goal in order to give other girls a chance to go top notch:) She wouldn’t have been able to do it without all the help of family and friends to bolster her cookie sales and leaders to find her cookies to sell! She is grateful to everyone and a little bashful of the attention given to her accomplishment. I, for one, am extremely proud of her:D Congrats to Claire on reaching her goal of getting Charlotte! And kudos to all the other girls who worked so hard to reach their incentives as well!